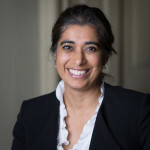 Anita Arora is a litigation solicitor based in our Gloucester office. She is experienced in personal injury, clinical negligence and serious personal injury. Anita joined the firm in 2005. She specialised exclusively in personal injury claims since she qualified in 1998 and as such brought with her a wealth of experience. Anita considers that empathy with her client is key. She believes that it is essential to understand her client’s needs. Anita grasps that compensation is often the key to putting lives back together. Anita recognises that dealing with the law can be a difficult experience, and she is an extremely good listener. She is respected within the firm for her ability to put clients at their ease during times of great personal stress. Anita practices in personal injury, employment, family litigation and probate. This broad knowledge base enables her to provide valuable input on many intricate aspects of personal injury claims. As a member of Resolution, Anita believes strongly in using a practical and realistic approach to legal matters, resolving complex issues in a supportive and positive way. Away from work Anita likes to spend time with family and friends. She is a keen swimmer. She likes walking particularly enjoying coastal walks.